Changing face of retail - US$195k for bottle of wine at airport shop! The world's most expensive bottle of wine is up for sale exclusively in an airport shop in Dubai. Why on earth would Chateau Margaux, an unbelievably famous French wine maker, produce a first-ever Balthazar (equivalent to 16 bottles) of its precious 2009 vintage and then decide to flog it in an airport terminal? 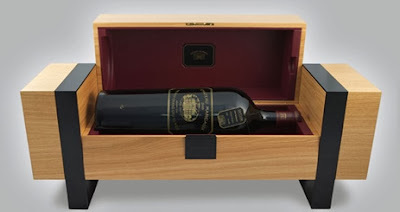 Even more incredibly, why would anyone choose to buy this particular bottle when 16 bottles of exactly the same wine would cost a fraction of the price - actually a grand total of around US$25K to be a little more precise? To get the technical stuff out of the way, Robert Parker, probably the most influential wine critic, gave this vintage 99 points out of 100 and we can confidently expect that to rise as this wine establishes its qualities over the next 100 years or so. And received wisdom states Bordeaux matures particularly well in large format bottles. Incidentally this is not the most expensive wine on a 'per-glass' basis as a 1945 competitor's wine is reportedly worth around US$3-4k per glass! So why would Chateau Margaux decide to exclusively sell three of its six 2009 vintage Balthazars (three will not be offered for sale) through Le Clos in Dubai's Terminal 3? Well along with many observers of retail I'm giving this innovative venture free publicity on the strength of its marketing back-story. Globally, Sky TV covered it and no doubt so did many other channels (click: Reuters)....so in truth, even though these bottles will not 'turn' quickly the oxygen of publicity has breathed viability into the venture. But what's also interesting is why the normally conservative brands of Bordeaux wine are now embracing brazen publicity. And I think we can thank the fashion industry and its catwalk tactics for this - the most outrageous fashion designs are the ones that get reported to the non-cognoscenti(sic). These are the designs that set the tone and build the brand for the less dramatic garments in the collections - the ones that are actually worn to parties and gala events. And why would a brand like Margaux that relies on appreciation and deep understanding go for a retail environment that boasts footfall rather than specialist knowledge? Dubai airport totally understands what it wants to stand for. It wants to literally be the world's 'hub'. It wants to be chosen as the place to swop planes. And to do that it needs to offer world-class everything. Sure, everything must be operationally smooth but to be truly chosen, it needs to offer world-class emotional precision - for everyone. Not just duty-free booze, perfume and pizza but an enriching experience where people look-forward to spending time stretching their legs and spending as much as they are able to afford. And first class passengers need to be surprised and delighted too...step forward the breathtakingly expensive watch counters and the world-first most expensive bottle of wine - and now start thinking catwalk tactics. Congratulations to Dubai airport for understanding the importance of knowing what it wants to stand for and its determined path to delivering a grand ambition. Congratulations to Le Clos, the specialist retailer, who is selling this bottle along with a myriad of tempting upmarket booze (I have shopped there many times and find their customer care impeccable) and congratulations to Chateau Margaux for some creative marketing and innovation thinking. Now think about some of the 'ordinary' retail experiences in your local areas. Where staff are being cut back and the same-old, same-old, keeps being re-hashed. Where there's no emotional connection, where product is more important than service and where retailers don't get why you're buying on-line from someone else rather than coming to their uninspiring shopping experiences to buy exactly the same things. The world and retail isn't changing, it's already changed, and it'll change again, and again - if it isn't new and exciting, it isn't happening!